For the first time, Roli's unusual touch-sensitive music-making tools won't break your budget. British music-gear company Roli is mostly known for its attempts at reimagining the piano. The full-size Seaboard and smaller Seaboard Rise may bear similarities to traditional keyboards, but their rubberized, touch-sensitive buttons let you modulate, pitch-bend and slide between notes in a way that's far different from what you can do on a standard keyboard or synthesizer. However, price is a big barrier to entry -- the Seaboard Rise starts at $800, while its full-size counterpart will set you back $2,000 or more. But Roli has been working on a way to bring its unique music-creation tools down to a much lower price point, and it's taking the wraps off those efforts today. 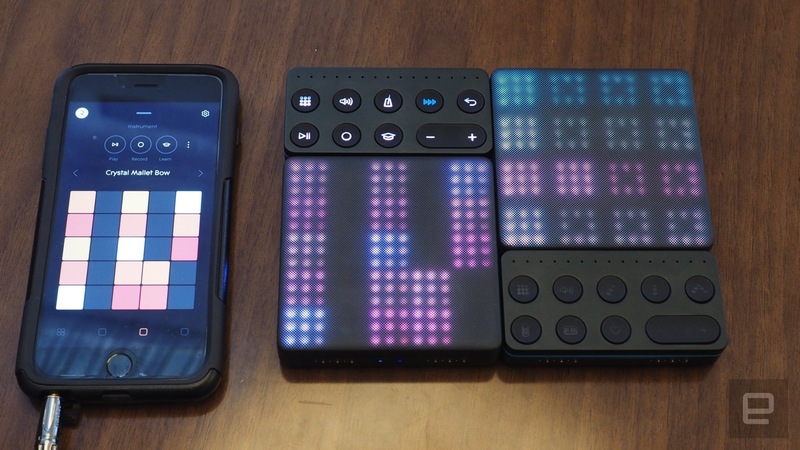 Roli Blocks are a set of modular synth controllers that snap together and hook up to your iPhone or iPad via Bluetooth. They're tiny and inexpensive: The main controller, called the Lightpad, is a small square (less than 4 inches to a side) that sells for $179. That's significantly cheaper than Roli's other products. And while you can't play the Lightpad like a keyboard, the short time I spent playing with it and the other Roli Blocks convinced me that it's still a powerful, flexible and fun music-making tool. 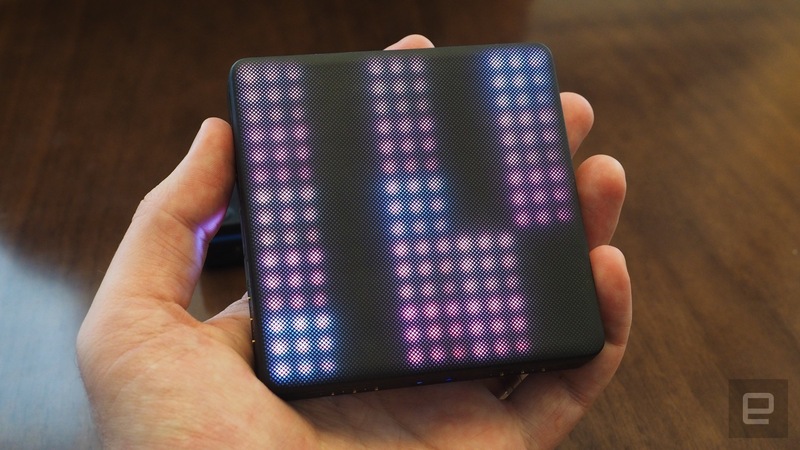 At a high level, the Lightpad is essentially a MIDI controller; it's useless without hooking it up to an iOS device. But once you do that and install the free Roli Noise app (only for iOS at the moment, but coming to Android soon), you can tweak the Lightpad in myriad ways. In the app, you can pick from 128 different software instruments like synths, bass instruments, pianos, guitars, pan flutes, drum sets and so on. Roli says it'll continue to release more free instrument updates, and it will also sell instruments created by professional musicians like Grimes, RZA and Steve Aoki. But most of the content you'll use to make the Blocks system work is already there in the free app. 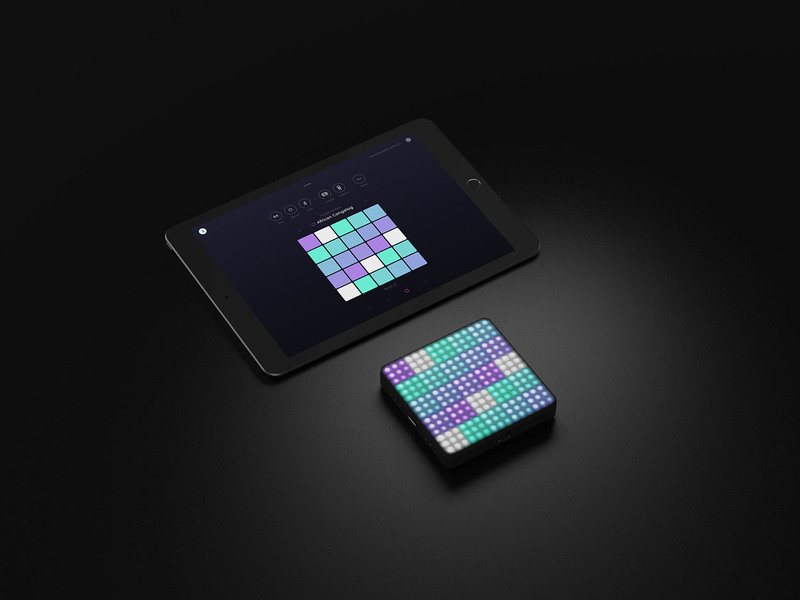 Once you pick a sound you're interested in, the Lightpad ... er... lights up in a 5x5 grid pattern, with each box representing a note in the chromatic scale. The fun starts when you press your finger down on the Lightpad's silicon-covered surface. The whole surface is pressure-sensitive, so the harder you bear down, the louder the initial tone will be. Holding your finger lets the note ring out, while different slides across the pad will let you tweak the sound in some major ways. If you slide horizontally, you'll bend the note to whichever pitch your finger lands on. But if you move up and down, you'll apply each instrument's modulation effect. You can move your fingers slowly in short strokes to apply a subtle effect, for instance, or quickly move your finger across the Lightpad to really tweak out your chosen sound. That's the gist of the Lightpad, but there is, of course, a lot more you can do inside the app. You can pick your scale (say, D major vs. E minor) and it will light up the pad with only the notes that fit into your chosen scale. That makes it a lot easier for someone who doesn't know much music theory to hit the "right" notes when making a composition. The app offers way more than just major and minor scales too. If you're a fan of the mixolydian mode, that's an option as well. You can still play "dark" spots on the pad outside of your chosen scale, but the lit-up points help you stay in line. You can also have arpeggiated patterns play when you tap a note. But while you can technically perform live on the fly with the Blocks system, it also has a fully developed recording and looping system. You can record multiple patterns, assign them to different "blocks" on the Lightpad and trigger them at will. You can also start by recording a drumbeat, layering a lead line and bass over it, and record that entire segment as one piece in a longer composition. I didn't get to play around with it too much, but in my brief demo, it seemed like a fairly robust system. And we haven't even gotten into the modular nature of Blocks yet. Each component has magnetic conductors on its side, so you can take two Lightpads, slap them side by side and the system will automatically recognize that you've extended your canvas and set it up appropriately. 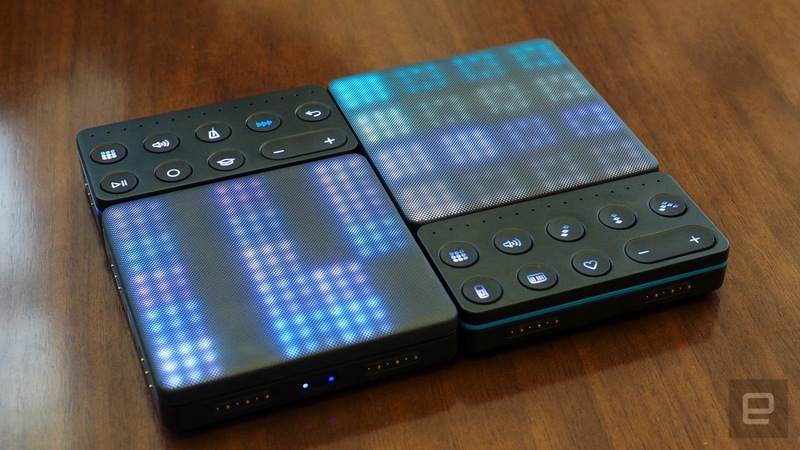 Roli is also offering two other blocks alongside the Lightpad: the Live Block and Loop Block (they cost $79 each). The Loop Block gives you instant access to the system's recording and playback features so you don't have to jump back and forth between your iOS device and the Lightpad while recording a new creation. The Live Block is meant for, well, performing live; many of the features buried in the iOS app are exposed here. You can page up and down between software instruments, switch keys and scales, change tempos and effects, and so on. While I was able to grasp how these additional blocks gave physical controls to features in the app, it's a bit harder to say how useful they'd be to most users. There's a definite learning curve here, though people who more proficient than I am at using sequencers and live electronic music gadgets might master it faster. Even so, Roli Blocks piqued my interest. I've always wanted to get a small, electronic music-making setup but have never quite found what I was looking for. Playing the Lightpad felt intuitive to me, and the vast array of sounds and other variables built into the Roli Noise app make it a very flexible system, particularly at this price. I don't know if the extra Live and Loop blocks are necessary just yet, but fortunately, you don't have to decide right away. In fact, the free iOS app includes a Lightpad-like view, so you can just start messing around there -- and if you get hooked, you can buy the physical hardware controller. If you'd rather try this all out in person, Roli's new gadgets will be available at Apple Stores this fall as well.